When working for Inspired Chef, this was a favorite. I will be making it for clients tomorrow. 1. Heat olive oil in large paella pan or saute pan. Brown the chicken and sausages and set aside. In the juice remaining, saute the garlic, onion and tomatoes until softened. Return the chicken to the pan, add the rosemary, paprika, saffron and rice. Saute until the rice is well coated. Add 1 cup of chicken stock and stir well to scrape up anything stuck to the bottom of the pan. 2. Add the remaining chicken stock. Cook for several minutes over hight heat, then reduce the heat. When much of the liquid has been absorbed, stir in the shrimp, sausage and green beans and cook gently until the rice is tender, about 20 minutes. Allow to stand 10 minutes before serving. Preheat oven to 325 degrees. Line a cookie sheet with parchment paper. Add above to wet ingredients and mix on slow speed until mixture comes together. Line cookie sheet with parchment paper. With wet hands, pour mixture onto cookie sheet and bake for about 15-20 minutes or until starts to brown. Cut into pieces and store in an air tight container. I will be at the Fresh Market in Altamonte this weekend making the Fillet with Gorgonzola Butter and Italian Pasta. Please stop in between 1 and 4 to get a taste. 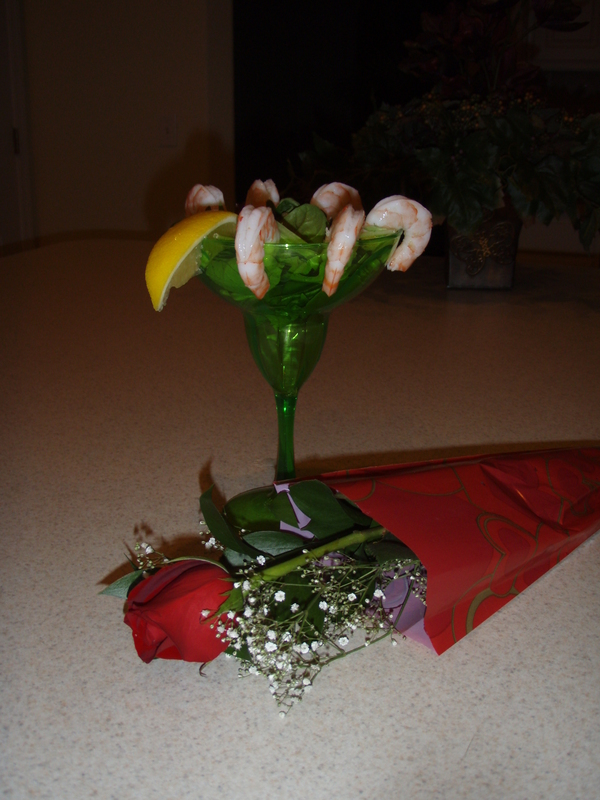 Here is a new shrimp recipe I am making for a special surprise birthday! This is a recipe from a company I used to work with, Inspired Chef. 1. In a food processor, puree together all teh marinade ingredients, to form a thick paste. Coat the shrimp well with the marinade, about 8 hours. 2. Salsa- toss all ingredients together gently in a non-reactive bowl. 3. Soak 10-12 skewers in water for 20 minutes. Place 3 shrimp on each skewer and cook on a very hot grill or grill pan for 1 1/2 minutes on each side. Serve warm or at room temperature with salsa.